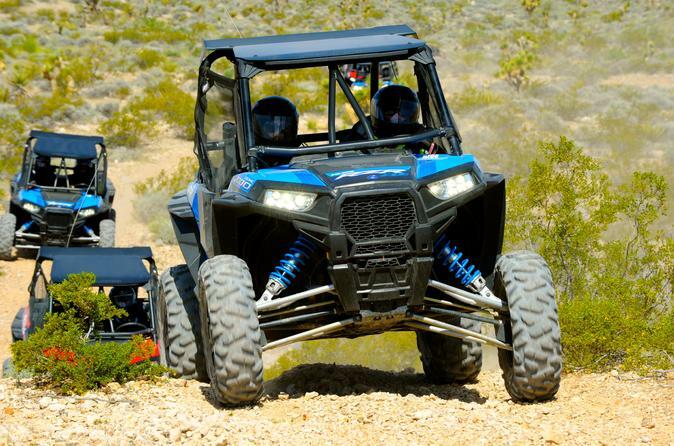 Spend some time away from the casinos to see the beautiful Mojave Desert on this RZR adventure. You'll be fitted for a Polaris RZR XP1000 UTV for 3.5-hours of ride time through exciting and exhilarating trails, along dry river beds and over amazing vistas. You'll stop at the historic Pioneer Saloon in Goodsprings, NV before returning back to Las Vegas. After hotel pickup from one of the designated locations along the Las Vegas Strip you'll be transferred by air-conditioned van to launch site in Jean, Nevada which is located approximately 30-minutes South of Las Vegas. You'll be checked in by the local operator, fitted for your helmet and safety equipment before taking part in a 30-minute safety and vehicle orientation. Then it's off to hit the dirt! You'll enjoy 3.5-hours of exhilarating ride time along the trails through the Mojave Desert. After 3-hours, you'll head to the historic Pioneer Saloon in Goodsprings, Nevada for lunch. Work off your meal with a 30-minute ride back to the launch site before driving back to Las Vegas. You'll arrive back with plenty of time to enjoy a night out on the town. Complimentary transportation, all required safety equipment, including a radio-equipped full-face helmet, complimentary bottled water and snacks during the tour and professional off-road tour guides are included. Please note: the price displayed is valid for the driver with passenger option. Minimum age for passengers is 14 year, minimum age to drive are 16 years with a valid drivers license.